An unadorned table holds a wooden box, a long pipe resting gently on its edge, a pitcher and several vessels. 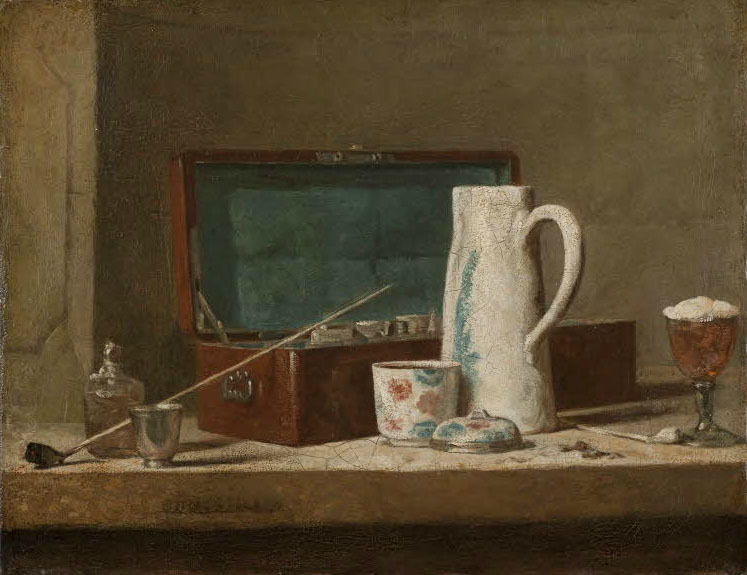 There is life in each object and in the paint Chardin used to represent them. I began thinking of Chardin, and other painters of "extravagant understatement", while reading the chapter "The Art of Gum-ball Machines" in Michael Kimmelman's wonderful book The Accidental Masterpiece: On the Art of Life and Vice Versa. I suspect it has to do with the particular quality of his silence. His are pictures of an extraordinary hushed reverence for the dignity of modest things, for paint's ability to simulate those things, and for a viewer's elevation through extended looking at those things. With Chardin one loses track of time staring, say, at a bunch of cherries, wondering at their translucence, then counting the cherries––there are five––and noticing that the five matches the sum of two peaches a green apple, and two sections of a split apricot to create perfect symmetry in the picture. A tiny observation, but like many simple facts of life, strangely marvelous when it turns out to be a key to some greater truth in life. Chardin's work is a compilation of these little facts that together make as true a record of the value of seeing the world in all its details as exists in the history of art. When you look closely at a Chardin painting, like this one at the Metropolitan Museum of Art, you marvel at the tenderness and care taken to paint these details: the hair of a rabbit, the shine of silver. 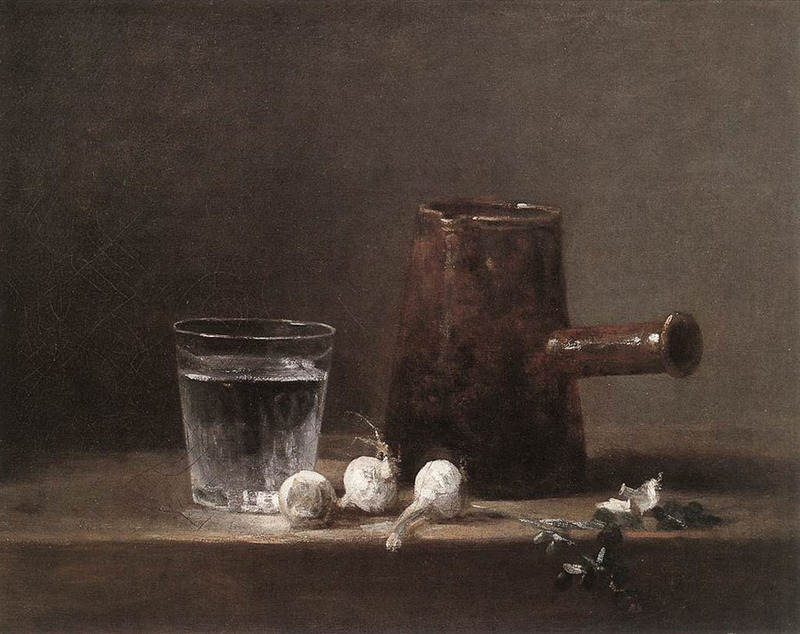 Chardin's simplest paintings touch me the most: why is it that a few commonplace things on the table––a drinking glass filled with water, a brown jug, three white onions with their roots still attached, a plant sprig––gathered in perfect balance, make me feel close to weeping. Kimmelman writes that "children see the world with fresh eyes". Maybe this is why artists who push us to look more carefully at simple things may also strike a slightly melancholic note. They remind us of a childlike condition of wonderment that we abandoned once we became adults and that we need art to highlight occasionally, if only to recall for us what we have given up. They also remind us of the fragility of life. These small pleasures, generally so fleeting, are given us to enjoy in a way that is beyond the physical. 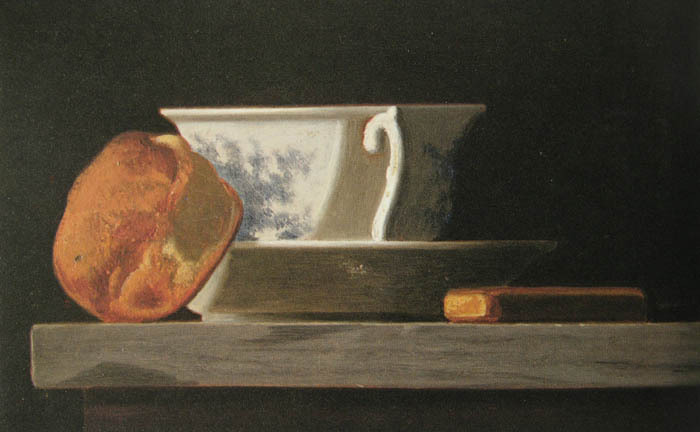 The paintings of an American, John F. Peto, have a similar sense of longing and loss as those of Chardin. I fell in love with his work at an exhibition at the National Gallery in the early 1980s. Much of his work is small––the three I'm showing you are less than 10 inches––but even the larger pieces have a sense of an arrested moment of intimacy. 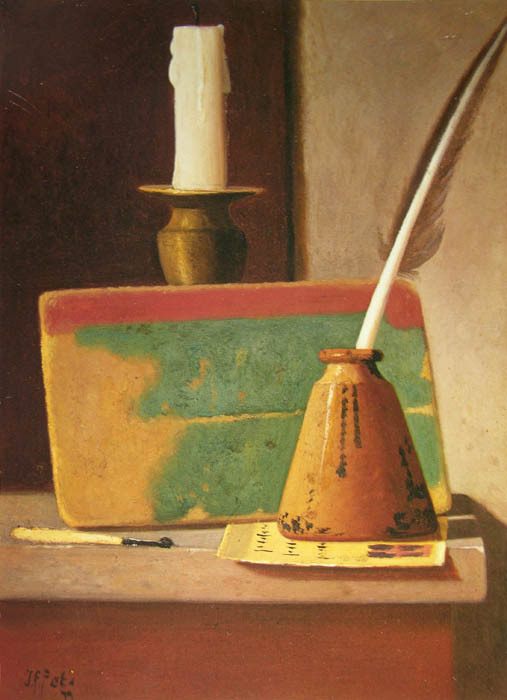 Like Chardin, Peto has a delicate, sensitive brush; the paint is descriptive yet alive. If you compare his paintings with those of his contemporary, William Harnett, Peto's have more life and a stronger formal presence; it is as though he is attempting to get at the soul of his objects, not simply their appearance. It is partly because Chardin and Peto have such a command of form––of color and light, structure and space, and a consummate command of brush and paint––that their images of quite ordinary things become transcendent. 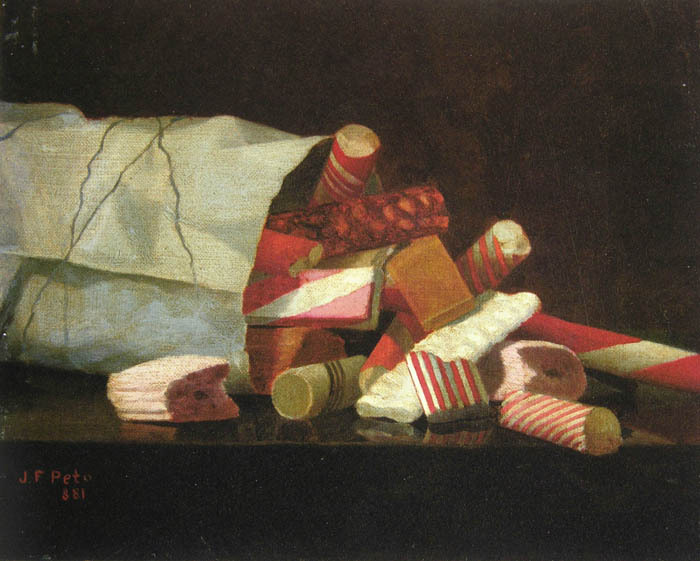 Who would have thought that a small painting of candy spilling out of a white paper bag would evoke life at its most poignant? Peto's compositions are rigorous, giving a sense that every volume, shape, and edge are carefully arranged. In this taut simplicity is a quiet eloquence. "To restore silence is the role of objects." he includes the ancient Greek mosaics of litter -- I see those in what's before me when I am at the beach or in the woods. Thanks, Susan. I did read the Bryson several years ago. I too love the litter floor mosaics. I like the light in the stills. I agree that the light is beautiful. These pictures and your commentary leads me to remember the Japanese "wabi sabi" melancholy and longing. But I believe that a large component of wabi sabi is imperfection, which I don't see in these paintings. Interesting how different our views are. 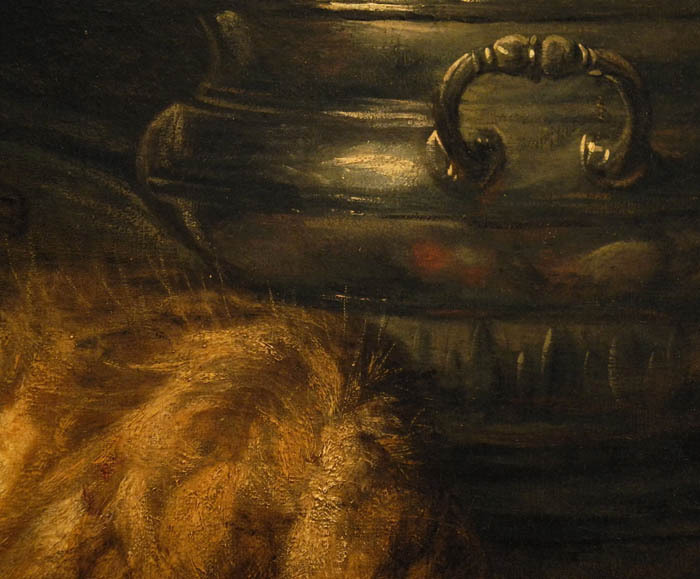 I see imperfection in almost every item in the paintings, yet overall they fit my motto, "perfect is good-enough"! Thank you so much for the introduction to John Peto. 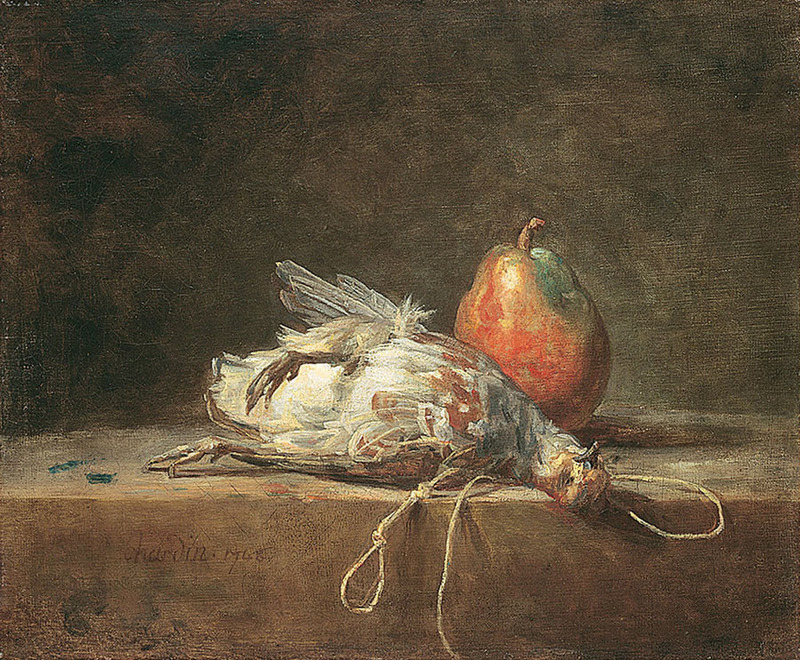 I love Chardin's work. I very much admire his paintings of children and maids too, although like you it's the simple compositions which are my favourites. Ah - I realise now, that two postcards I bought when we lived in New Hampshire are by Peto: The Cup We all Race 4 and The Poor Man's Store. Thank you again for drawing my attention. Olga, yes, those are beautiful Peto paintings you have on the postcards, larger works than the ones I've illustrated here. For me he's one of the great American painters. A New Textile: "Split Circle"
A New Painting: "Disk and Pipe"
A New Painting, A Diptych: "Black Disks"